The revolutionary tool is based on a grid system of varying widths and densities. Intensity levels are in your control by repositioning the Grid. The Matrix of 3-D Distrodensity Zones allows for blood and oxygen to channel through and create elasticity in the muscle to deliver a precision massage associated with Self-Myofascial Release Therapy. Sturdy EVA foam will not break down with normal day-to-day use. Length: 13 in. Diameter: 5.50 in. Weight: 23 oz. Imported. QUICK RECOVERY - Prevents costly injuries and shortens recovery time. Use on quads, hamstrings, calves, traps, shoulders, neck, lower back and more! Release trigger points, increase blood flow and aid myofascial release of cramping, aching, sore joints. UNMATCHED QUALITY - NO Bending, NO Breaking, NO Squeaking, No Ripping Out Hair. This 17.5 massage roller stick is built with a solid core tube and 10 reinforced plastic gears in tread design. No noise in using. PORTABLE - Compact and lightweight size makes our massage roller easy to store in small spaces, a perfect additon to your home equipment. 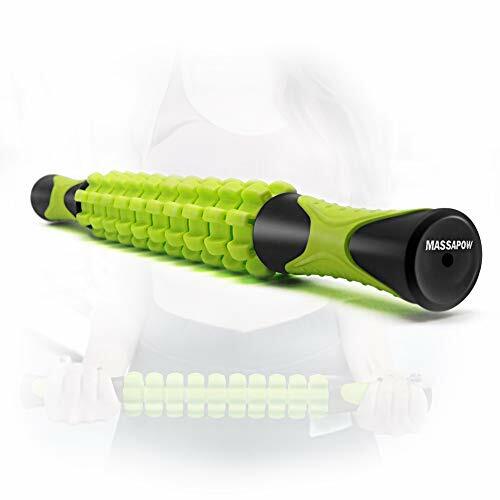 Muscle Roller Sticks are recommended by physical&massage therapists and personnel trainers and used by thousands to enhance their workouts and sports fileds. 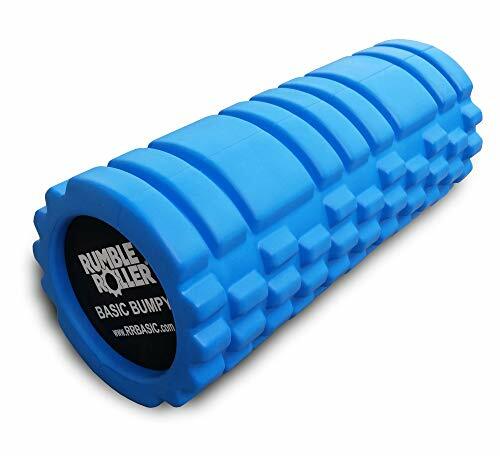 From the manufacturer RumbleRoller - The Originator of Deep-Tissue Rolling The first foam rollers were smooth, and only used by a few physical therapists. 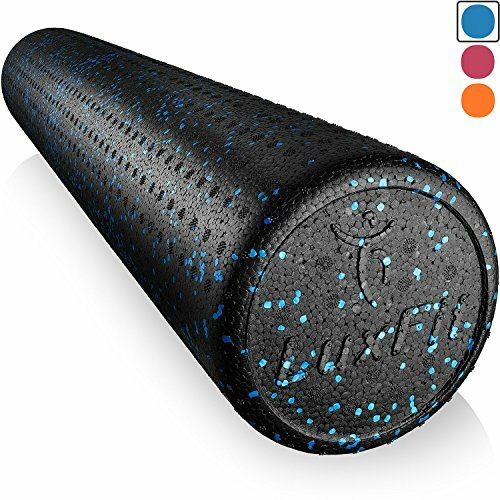 But in 2009, foam rolling was forever changed with the introduction of RumbleRoller - the first true deep-tissue roller. RumbleRoller now manufactures a complete line of high performance foam rollers and massage tools. RumbleRoller Basic Series Rollers - Simpler and Lower Cost RumbleRoller's Basic Firm and Basic Bumpy were engineered to provide exceptional value at the lowest possible price. While not as effective as our Professional series products, they're a great option for those who are just getting started with foam rolling. Instructions Included RumbleRoller's Basic series rollers include a 20-page downloadable user guide which explains the best rolling positions, techniques, and tips. We'll also show you where to find advanced educational courses developed by RumbleRoller and other industry experts. You'll benefit from the same instruction we've provided for years to professional athletes. 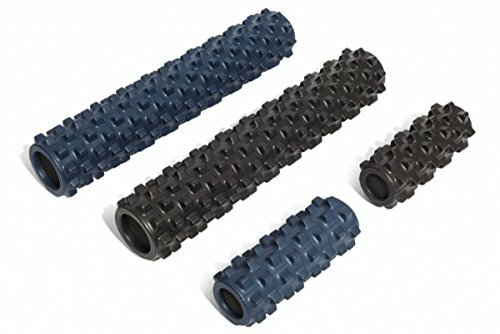 TriggerPoint GRID foam rollers feature a patented design that offers a superior, multi-density exterior constructed over a rigid, hollow core that withstands repeated use while maintaining shape and integrity. The proven durability of the GRID has helped make it a trusted tool of physical therapists, massage therapists, athletic trainers and professional athletes. The GRID can be used to roll through tight muscles, knots and kinks to reduce soreness and improve mobility. Regular use of the GRID can provide benefits such as recovery from (or preventing) injuries, decreased muscle and joint pain, increased circulation and flexibility, improved balance and mobility and preparing the body for peak performance. The distinctive, multi-dimensional surfaces of the GRID replicate the feeling of a massage therapist s hands - wide and flat like the palm, long and tubular like the fingers, and small and firm like the finger tips. The textured surface of the GRID helps to maximize the flow of blood and oxygen to heal tissue. TriggerPoint GRID foam rollers are available in three sizes and two densities. Regular density models include the original 13-inch GRID, the 26-inch GRID 2.0, and the 4-inch travel-friendly GRID Mini. The 13-inch GRID X features extra dense foam for working the tightest muscles. 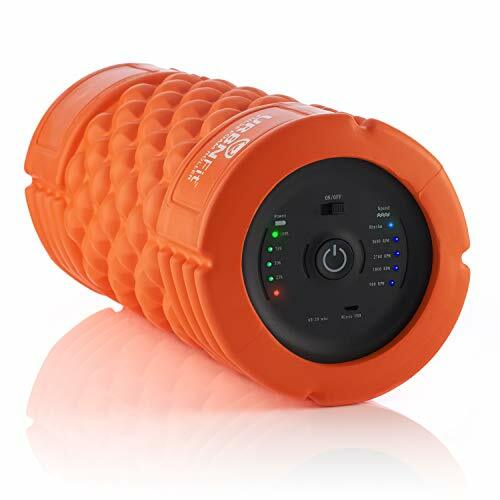 Purchase of any TriggerPoint GRID foam roller includes free access to an online instructional video library from the experts at TriggerPoint that illustrate the best foam roller techniques. 1-year warranty. Have you been looking for high quality? If so, you have landed on the right Listing! Our towels are imported from Turkey, a country that is famous for its high quality textiles and towels. 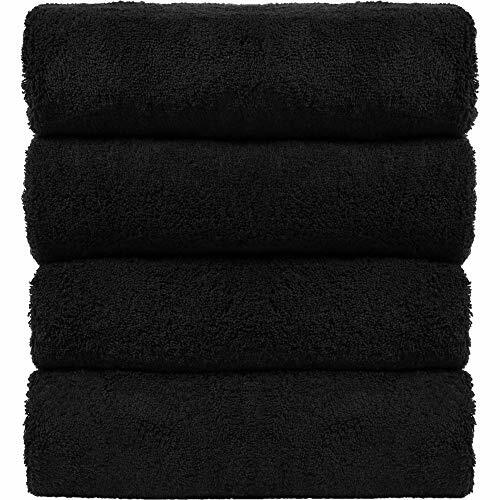 The towels are made of 100% absorbent cotton and do not contain any harmful dyes. No dangerous chemical solvents are used in post production. SATISFACTION GUARANTEE: We believe you will love our towels quality and softness. We have one goal -- Help you achieve your fitness goals. That's why we offer a 100% satisfaction guarantee on all of our home exercise equipment. If you have any issues we'll fix it, that's our promise. RECOVER FROM WORKOUTS FAST - Foam rolling after your workout increases flexibility, mobility, pliability, circulation, and reduces muscle soreness to help you recover quicker and get back to the gym. Used by Professional athletes and people just starting their weight loss journey, muscle rollers are an essential piece of workout equipment to have in your routine. CHOOSE FROM 5 VIBRATION LEVELS - Switch between low and high intensity massaging levels to help relieve sore muscles and give you a relaxing, comforting massage. 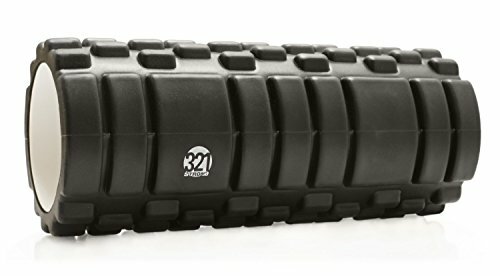 Incorporating the roller's vibration into your post workout foam rolling aids in relieving pain in your Calves, hips, lower and upper back, shoulders, arms and more. Simply place the roller on the floor or up against a wall, adjust your intensity level and roll your sore muscle. BUILT TO LAST AND LONG BATTERY LIFE - The interiors are made from eco friendly ABS plastic. The exterior shell has a smooth, The EVS foam on exterior has a smoothed finish with customized grooves, placed to optimize your roll. Measuring 13 inches long and 5.5 inches in diameter, the rechargeable battery on our vibrating roller LASTS FOR 6 HOURS on its highest intensity. To Recharge, plug the included USB cord into a USB port. A full recharge takes about 3 hours. COMES WITH A FREE PDF STRETCHING GUIDE - We want to make sure you get the most out of your Foam Roller. We worked with professional trainers to create the ultimate stretching guide and will email it directly to you for FREE in a convenient PDF with your purchase. THE 100% URBNFit PROMISE - We're here to help our customers reaching their fitness goals. If you have any issues with your Hip Bands, get in touch and we'll be happy to make it right.